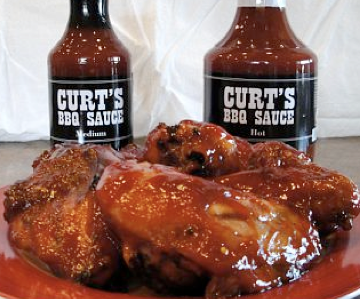 Curt's BBQ Sauce is a family owned and operated business that began in 2007. However, the sauce for the recipe dates back many years prior. Since making Curt's available to the public, the sauce's popularity in North Dakota grew so quickly that the family was unable to keep up with the production demands. They now Full Service Foods (Hillsboro, ND) to do their bottling. Though each bottle is no longer canned and sealed by hand, the integrity of the original recipe remains in tact. The simple formula for Curt's starts with tomato concentrate and adds sugar, vinegar and a variety of spices. Curt's BBQ Sauce is sweet, with a medium thickness and bright red color. 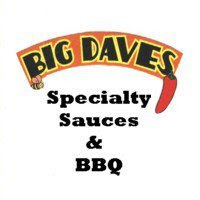 The sauce is available with three different heat levels and can be purchased in 16 and 32 oz. glass bottles or gallon jugs. By design, Curt's BBQ Sauce is sweet, tangy and lacks the smokiness of most thick tomato sauces. In addition to chicken and ribs, Curt's website recommends using the sauce for everything from pizza to french fries. Curt's does have a high sugar content. When cooking over high heat, care should be taken to prevent charring. I had the opportunity to cook three racks of spareribs in my newly purchased Masterbuilt smoker today. I seasoned the ribs with Oakridge BBQ's Secret Weapon rub and sauced them with Curt's BBQ Sauce (Medium). The thick, red sauce was fantastic on the ribs. The sauce was very sweet and tangy out of the bottle, but the flavors mellowed a bit when the sauce was heated and applied to the ribs. The sauce gave the ribs a terrific red glaze. Curt's is the type of sauce that I really love on ribs. The sweetness and tang from the sauce balanced the smokey pork and slightly salty rub. Not only did the sauce provide great color and flavor, it also added a third (often underrated) element....stickiness. In my humble opinion, ribs are at their absolute best when glazed with sauce that sticks to your fingers and face just as well as it sticks to the meat. I've tried many, many great rib sauces and Curt's can hold its own with the best of them. For people who love a sweet, sticky sauce on ribs or chicken, Curt's is an excellent option. Learn more about Curt's BBQ Sauce by visiting their website. See how they rate on our "Product Reviews" page. 2 Response to "Curt's BBQ Sauce"
Did some st.louis ribs for the first time on my Big Steel Keg. Used Oakridge competition rub and Curt's hot(not that hot)sauce. Best bones ever. Better than any famous rib joint I have ever been too. Curt's hot is a little thicker than the medium and perfect heat to sweet. Thanks for the great reviews. Curt's and Oakridge is an awesome combination for ribs. I've had great results pairing Curt's Medium with Oakridge's Secret Weapon rub.